Thanks to everyone for coming out to our Powell Street Festival show on July 31. You were an amazing audience! We hope to entertain you again in the very near future. Btw, anyone interested in a slightly bruised watermelon? Special thanks to the wonderful Powell Street Festival organizers/volunteers, especially Julie Aoki and Kazuho Yamamoto; Jamie Burns and the Firehall Arts Centre; Ann Chow; Andrea Bang; and Laura McLean. Please check back for upcoming show details, as well as new videos and blog posts. In the meantime, check out these two great shows from our talented friends. One party. Four perspectives. Do you know the whole story? Experience a house party you will never forget, through the eyes of four pivotal party guests. Mingle, eat and drink, following one of these characters through the house each night. Come for one show or all four to get the whole story. Party This Weekend is an original, interactive theatre experience presented by The House Party Collective, in association with Scarlet Satin Productions. 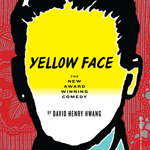 ReAct Theatre and the Pork Filled Players (with sponsorship by the Furuta Lee Foundation) proudly present the Northwest premiere of Yellow Face, the Pulitzer-finalist and Obie-award winning comic “mockumentary” about mistaken racial identity by David Henry Hwang. Casting himself as the protagonist, Hwang recounts his (maybe true, maybe not) hard-hitting attempts to protest yellow face casting in Miss Saigon on Broadway — and his own accidental casting of a white man as Asian. Mixing real events, real headlines and real people with fictional characters and dramatic license, Yellow Face explores and pokes fun at the role of race in modern American society, media, politics and theatre. This entry was posted on August 9, 2011 by assaultedfish. It was filed under Uncategorized and was tagged with laura mclean, pork filled players, powell street festival.